Remembering Doris Washburn | Remembering Doris Washburn | De Soto Obituary Search | Dietrich-Mothershead Funeral Home, Inc. Remembering Doris Washburn | De Soto Obituary Search | Dietrich-Mothershead Funeral Home, Inc.
Doris Kathleen Washburn, formerly of De Soto, currently of Crystal Oaks Assisted Living, was born in De Soto on September 28, 1924 a daughter to James Roussin and Virginia “Virgie” (nee Sullivan) Roussin Williams. She went to be with her Lord on August 1, 2015 at Mercy Hospital-Jefferson at the age of 90. She was preceded in death by her husband Calvin Washburn with whom she had been married for 70 years prior to his passing on January14, 2013.She is survived by her children; Barbara (Albert) Craig, De Soto, Dan (the late Nina) Washburn, De Soto, and Jim (wife Diane) Washburn, De Soto; grandchildren: Paul (Missy) Craig, St. Peters, Danni (John) Foreman, De Soto, John (Linda) Washburn, Farmington, Jennifer Washburn, De Soto; ten great-grandchildren; eight great-great-grandchildren; and two sisters: Eva Jean (Billy Gene) Eichelberger, De Soto and Charleen Jones, De Soto. She is preceded in death by her parents; one grandson: Dan Washburn, Jr.: one sister Evelyn Schnitker and her husband Bill and a brother-in-law Arnold Jones. 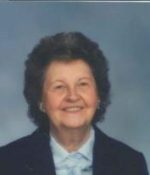 She was a member of the Primitive Baptist Church and especially enjoyed going to church. 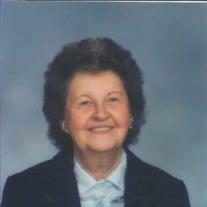 She also loved cooking for and being with her family as well as going to yard sales and bingo. Elder Jim Ridings will officiate the services.